Hi guys, happy Friday! 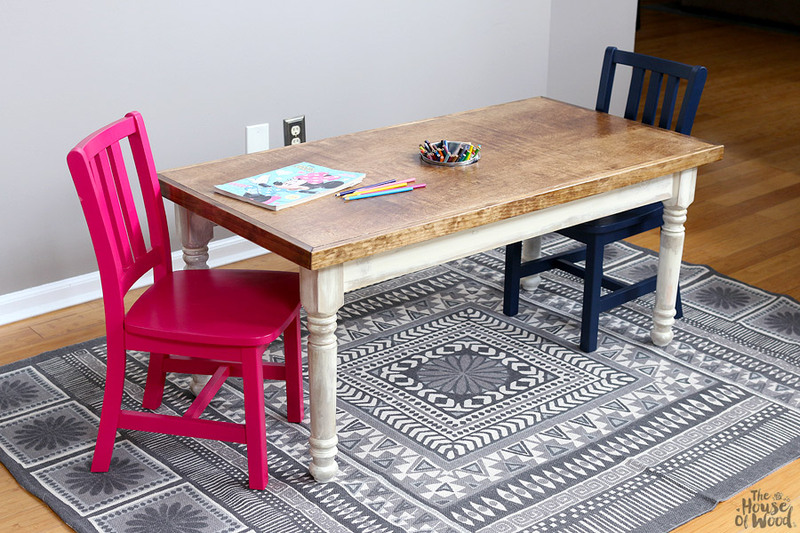 I’m thrilled to share my latest DIY project with you – this farmhouse-style kids’ craft table! Isn’t it adorable? 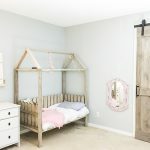 The farmhouse trend is still going strong and I thought making a kid-sized version would be the cutest. I mean, kid furniture doesn’t have to look like kid furniture, right? In fact, I think it’s even more adorable when it’s just a miniature version of the real deal. I mean really. Will you look at this adorableness? I can’t even. 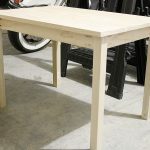 I teamed up with my friends at BuildSomething.com to bring you the free building plans for this table. BuildSomething.com is a new site where folks can browse DIY projects, share their own plans and builds, and join a great community of builders and DIYers. 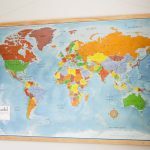 This site is perfect for those who want to share their projects, but don’t have a blog or site of their own. 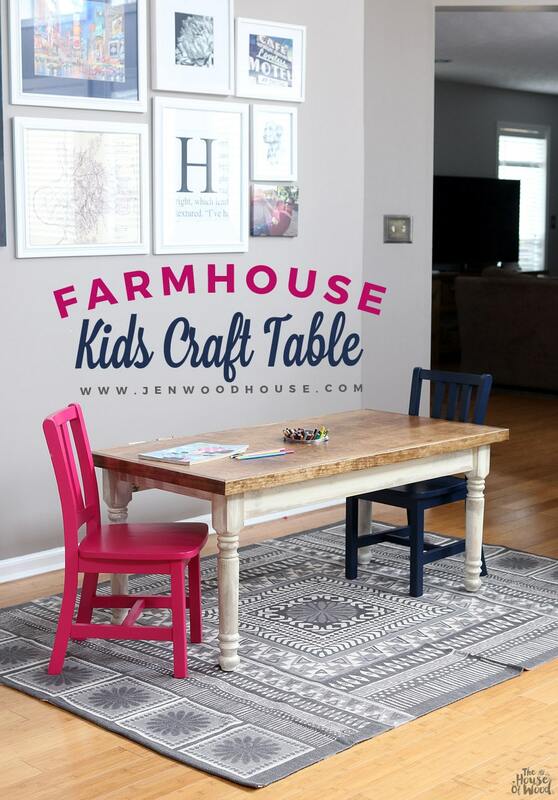 Click here to download the plans for this Farmhouse Kids Craft Table. This table is made out of real wood (not plastic! 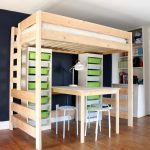 ), it’s roomier than your standard play table, and there’s storage for art supplies, as well as a couple of secret cubbies, just for fun! And don’t you love those turned legs? I got them from my friends at Osborne Wood. They’re called the Farm End Table leg and I chose the knotty pine species. And guess what! The friendly folks at Osborne Wood are offering one lucky winner a set of these farm end table legs! Enter via the Rafflecopter widget below. If the widget doesn’t immediately show up, simply refresh the page and you should see it. *Update: this giveaway is now closed and a winner has been chosen and contacted. 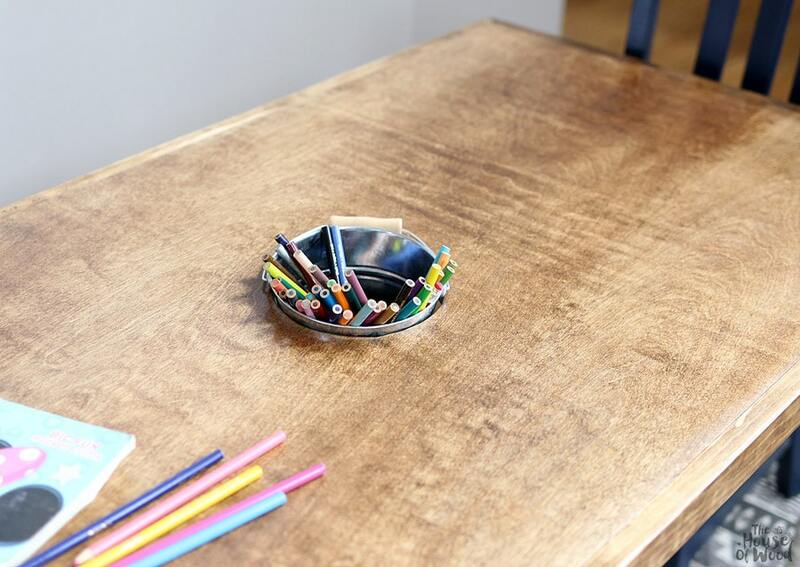 I designed the table to include extra storage for art supplies, books, or small toys. 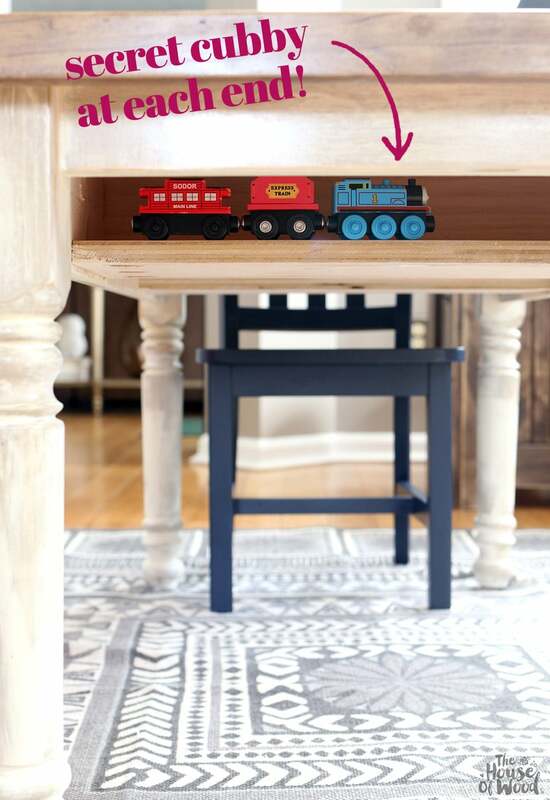 And how fun is this: a secret cubby hidden underneath each end for kids to stash small toys, books, or snacks. My kids could hardly wait to start using their table. I did manage to squeeze in a few photos before the table was overtaken with crayons, crumbs, and coloring books. 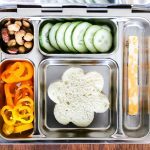 I love that they love their new work space and it’s perfect timing for the fast-approaching holidays – they’re more than happy to be relegated to the kids’ table for Thanksgiving dinner. 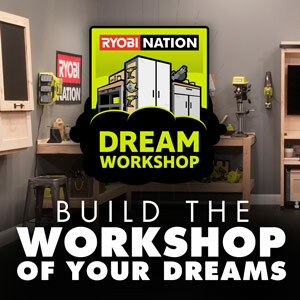 Be sure to stop over at BuildSomething.com to snag the free building plans so you can build your own just in time for Turkey day! Happy building, friends – hope your weekend is full of sawdust! 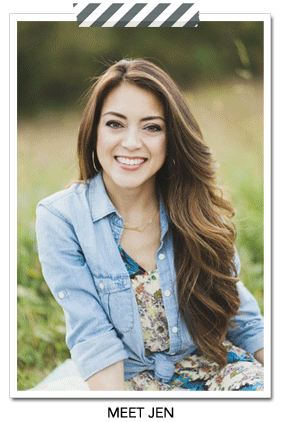 I would love for you to PIN and SHARE this project! Thank you for spreading the love! I love the table!!! Where did the rug come from? I am in the process if making our office into a craft room, too, and my girls need a craft table. This would be perfect! So cute! The rug is still available btw. Just go to SALE tab and click on rugs and its under there (we just ordered one). Great job on the table! Hi Jen! What did you use you finish the legs and apron? (materials and techniques). Making a taller version of this, this week for a desk for Maggie! Thanks in advance. 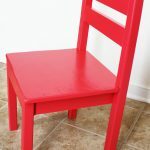 First, stain the legs with a medium-brown stain (Special Walnut or Provincial), then paint over it with Old White white chalk paint, then distress various areas to reveal the stain underneath. Finish with a clear satin poly. Good luck! I used the knotty pine species, which runs about $15/leg. I believe you can buy similar turned legs at Home Depot, for quite a bit less. I used some scrap wood for my project, however I don’t expect this table to cost more than $100 in materials. Hope that helps! Like Jen said, you can get legs at the big box stores… I got taller legs at Lowes for $15 each, and the rest of the wood (had to get the “select” finished wood because the rest of it at Lowes was all warped beyond using) cost about $60. Plus the cost of the Kreg jig, screws, glue, etc… Ours came out awesome! Thanks Brian! Yes, $60 is an awesome price, IMO. Your table looks great – love that routed edge! 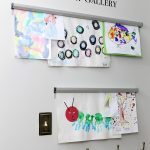 Hi Jen, we just made one of these for my grandkids, to keep in my craft room, for when they are over! I love these chairs, where did you locate them at? So glad to hear! There is a product source list at the very bottom of this post. Thanks for writing! Very cool table, Jen, thanks for sharing! I was wondering if you’d share your technique for getting the table top to look like that please? Thanks Kel! I used 3/4″ Purebond Plywood in maple and sanded it with 150-grit, then 220-grit sandpaper, then stained it “Provincial”. Three coats of polyurethane (sanding with 320-grit in between each coat) and you’re done! Hope that helps. I’m looking to make this table and I saw in the comments about how you finished it. With the poly did you use a clear water based satin poly like Polycrylic on the stained top as well as the painted bottom? I can’t remember which poly I used on this table specifically, but I do tend to use either a water-based Polycrylic or a wipe-on poly called Arm-R-Seal made by General Finishes: http://amzn.to/2ibLy8r Hope that helps! 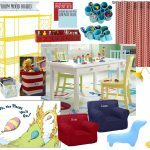 Are plans for kids farmhouse craft table available? Can’t find them anywhere.